These fruit print bodysuits are so cute! They are short-sleeved in organic cotton jersey with press-studs at the crotch. 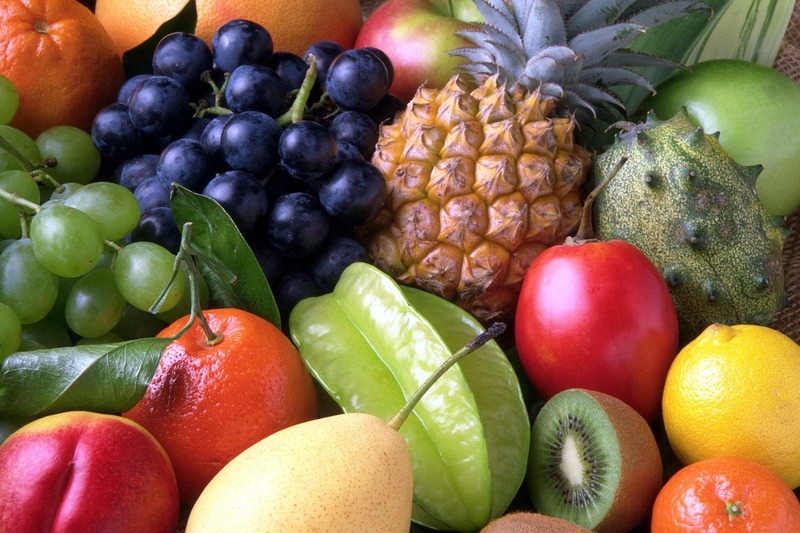 Featuring pears, kiwi fruit, cherries and bananas! The banana print is definitely my favourite – I do love a bold print, and it’s certainly that! These are part of the H&M Conscious range; it’s their way of making more sustainable fashion choices available, affordable and attractive to as many people as possible. You can find out more about their commitment to sustainability here. The pack of 6 is just £14.99. This organic crew t shirt is soft, cozy, and something you can feel good about. I love the apple and tomato on the front of this top – so sweet! 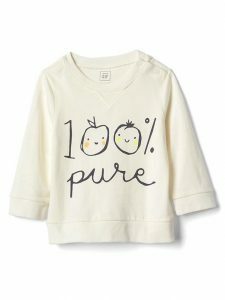 All kids are 100% pure 100% of the time, right?? I’m a huge huge fan of The Very Hungry Caterpillar; it was one of my very favourite books as a child and – although my little boy isn’t a huge fan as yet – i’m hoping to turn him into one! 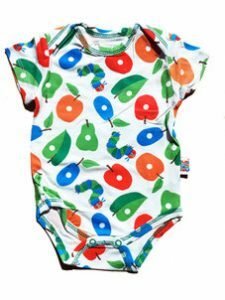 This bold, short sleeve bodysuit is inspired by Eric Carle’s classic tale and features lots of the gorgeous fruit that the Very Hungry Caterpillar snacks on throughout his journey. Made of a soft & silky blend of viscose from bamboo. Available in sizes Newborn – 9 Months. Pair with the coordinating cap or book for the perfect gift! What’s sweet, colourful and helps them get to sleep? 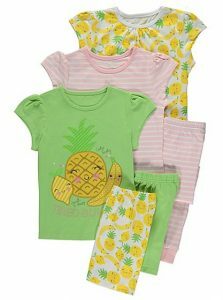 This set of 3 pineapple-printed pyjamas! With everyone’s favourite cute fruit, this set includes 3 tops, 1 pair of long pyjama bottoms and 2 pairs of short ones they can mix and match. I do love a multi-pack – especially one that you can mix and match.